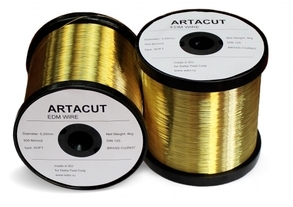 SIC Delta-Test supplies brass wire EDM machines own brand ARTACUT. The production is organized on our European venture partner with the use of modern equipment in accordance with European and international quality standards. Wire ARTACUT can be effectively used to produce SIC Delta-Test machines ARTA and other equipment. Always in stock standard types of wire on the spools K125 (4kg) diameters of 0.20, and 0.25, 0.30 mm, as well as other types.